Al Madina Tripoli (D1) agreed terms with 26-year old Ivorian forward Bernard Morena (203-91kg-91, college: Kennesaw State). He supposed to play at Cambados Cidade Europea do Vino 2017 in Spanish LEB Silver. Morena graduated from Kennesaw State in 2016 and it is his second season as a professional player. Here is the weekly review of the top performing Ivorian players, who play currently abroad. #1. This week's number one is former international center Cedric Bah (198-94, currently plays in France). He led Souffelweyersheim to a victory over the eighth-ranked Rueil (5-8) 91-79 in the French NM1 (third division) in Saturday night's game. Bah was MVP of the game. He had a double-double by scoring 25 points and getting 10 rebounds. Bah also added 3 assists and 2 blocks in 30 minutes on the court. BC Souffelweyersheim (10-2) is placed first in Places 1-10 group. Bah has relatively good stats this year: 10.6ppg, 6.0rpg, 1.6apg, 1.5bpg, 1.1spg, 2FGP: 49.3%, 3FGP: 23.8% and FT: 75.3% in 30 games he played so far. He played for the Ivorian senior national team two years ago. #2. Second place goes to an international point guard Jean-Francois Kebe (185-94, currently plays in France). Kebe was the main contributor in Saint-Quentin's victory against the fourth-ranked Vendee Challans (8-5) crushing them 89-58 in the French NM1 (third division) last Friday. He was the best player in that game. Kebe scored 17 points and added 4 assists. Saint-Quentin Basket-Ball (9-4) is placed third in Places 1-10 group. This season Kebe averages: 7.1ppg, 2.0rpg, 2.7apg, 2FGP: 56.6%(43-76), 3FGP: 23.7% and FT: 71.3%. He is in the roster of the Ivorian senior national team. #3. The Ivorian player who performed third best last week abroad was an international swingman Guy Landry Edi (202-88, college: Gonzaga, currently plays in France). Edi could not help Chalons-Reims (18-9) to beat Limoges CSP Elite (15-12). He scored 9 points in only 9 minutes. But Chalons-Reims lost 84-88 on the road to the lower-ranked (#8) Limoges CSP Elite. This year Edi's overall stats are: 3.7ppg, 1.4rpg, 2FGP: 71.4% and FT: 66.7% in seven games. He has a dual citizenship: Ivorian and French. Edi is also a member of the Ivorian senior national team. #4. Swingman Charles Abouo (196-89, college: BYU, currently plays in France) was not able to help ADA Blois (13-12) in their last game. Despite Abouo's good performance ADA Blois lost 73-84 in Vichy to the second-ranked JA Vichy. He was the top scorer with 14 points in 32 minutes. They ended the series of three consecutive victories. It's Abouo's first season with the team. This year Abouo has relatively solid stats: 11.3ppg, 4.1rpg, 1.8apg and 1.2spg in 13 games. He is another player who holds two passports: Ivorian and American. Abouo is also Ivorian national team player. #5. International point guard Souleyman Diabate (181-87, currently plays in France) was not able to secure a victory for Sluc Nancy (18-8) in their game against SPO Rouen (17-9) in the French ProB (second division). He scored only 4 points, made 9 passes and 6 steals. Sluc Nancy was defeated 82-68 in Rouen by the lower-ranked SPO Rouen (#6). Diabate's total stats this season are: 8.3ppg, 1.6rpg, 5.8apg and 1.5spg. He plays currently for the Ivorian national team. #6. Center Aboubacar Aboubacar Hima (207-94, currently plays in Spain) couldn't help Carramimbre (17-14) in their game against Oviedo CB (21-10) in the Spanish LEB Gold (second division). Aboubacar Hima recorded only 4 points and grabbed 12 rebounds in 33 minutes. Carramimbre lost 79-85 on the opponent's court to the higher-ranked (#3) Oviedo_CB. It was Carramimbre's first loss after three consecutive victories. There are only three games left until the end of the Regular Season. So now every game will be critical. This year Aboubacar Hima's total stats are: 4.6ppg and 5.4rpg in 31 games. He is a former international player as he played for the Ivorian senior team two years ago. #7. International center Bali Coulibaly (199-95, currently plays in France) contributed to a La Rochelle's victory against the ninth-ranked Kaysersberg (4-9) 69-65 in the French NM1 (third division) on Saturday night. Coulibaly had a double-double by scoring 12 points and getting 13 rebounds in a mere 19 minutes. Stade Rochelais Basket (5-8) is placed seventh in Places 11-20 group. There are only three games left until the end of the Second Stage. So now every game is very crucial. Coulibaly has reliable stats this year: 10.6ppg and 4.3rpg in 27 games. He is also Ivorian national team player. #8. An experienced center Mohamed Kone (211-81, college: Valpo, currently plays in France) faced previously mentioned Charles Abouo in the French ProB last game. Kone helped JA Vichy win their game against the ninth-ranked ADA Blois (13-12) 84-73. He recorded a double-double by scoring 11 points and getting 10 rebounds. Kone has averaged so far 8.7ppg, 8.5rpg, 1.1apg and 1.1spg. He plays currently for the Ivorian national team. #9. International swingman Vafessa Fofana (198-92, currently plays in France) managed to help Hermine Nantes Atlantique in a victory against the 16th-ranked Aix-Maurienne (8-18) 87-78 in the French ProB (second division) last Friday. Fofana scored only 2 points and added 4 passes in 26 minutes. Hermine Nantes Atlantique (13-12) is placed tenth in the ProB. Fofana has averaged so far 9.4ppg, 5.0rpg, 3.1apg and 1.1spg in 25 games. He is also in the roster of the Ivorian national team. #10. Forward Moussa Kone (203-93, college: Hofstra, currently plays in Spain) helped Palencia Baloncesto win their game against the league outsider Araberri (7-24) 94-82 in the Spanish LEB Gold (second division) on Saturday night. Kone recorded only 4 points. Chocalates Trapa Palencia (18-13) is placed seventh in the LEB Gold. There are only three games left until the end of the Regular Season. So now every game will be important. Kone has averaged so far 5.9ppg and 5.0rpg. He has both American and Ivorian nationalities. Kone is a former international player as four years ago he still played for the Ivorian senior national team. #11. International point guard Bryan Pamba-Juille (184-92, currently plays in France) couldn't help Caen in their game against Saint Chamond in the French ProB (second division). He scored 6 points in 36 minutes. His team lost 64-72. Pamba-Juille has averaged so far 7.6ppg, 2.1rpg, 2.4apg and 1.1spg in eight games. Despite he played previously for the French U20 national team, Pamba-Juille is currently in the Ivorian national team roster. #1. Experienced Alain Koffi (207-C-83, agency: BeoBasket, currently plays in France). He could not help Gravelines-Dunkerque (17-9) to beat Boulazac Basket (10-16). Koffi scored 6 points and grabbed 4 rebounds. Gravelines-Dunkerque was defeated 72-65 on the road by the lower-ranked Boulazac Basket (#11). Koffi's total stats this season are: 9.4ppg and 5.5rpg. He has a dual citizenship: Ivorian and French. #2. Jonas Zohore (208-C-91, currently plays in Hungary) was not able to help TF Budapest (2-26) in their last game on Wednesday. Despite Zohore's good performance the fourth-placed TF Budapest (2-26) was defeated 86-81 on the opponent's court by the leading Kaposvari in the Places 11-14 group. He scored 12 points, had 8 rebounds and dished 3 assists. There are only four games left until the end of the Second Stage. So now every game will be critical. Zohore has reliable stats this season: 13.5ppg, 9.4rpg, 1.4apg and 1.1spg. He is another player who holds two passports: Danish and Ivorian. We bring you last week's top performances from Ivorians who are playing abroad and who all have had prior experience of national team duties at youth or senior level. #1. 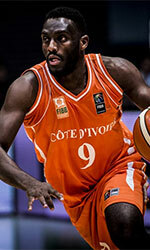 This week's number one is former international center Cedric Bah (198-94, currently plays in France). He could not help Souffelweyersheim (9-2) in their last game. Despite Bah's very good performance the first-placed Souffelweyersheim (9-2) lost 63-75 on the road to the lower-ranked (#5) STB Le Havre in the Places 1-10 group. He was the top scorer with 18 points. Bah also added 7 rebounds and 4 assists in 29 minutes on the court. It's Bah's first season with the team. He has relatively good stats this year: 10.1ppg, 5.8rpg, 1.6apg, 1.5bpg, 1.1spg, 2FGP: 49.3%, 3FGP: 23.8% and FT: 75.3% in 29 games he played so far. Bah played for the Ivorian senior national team two years ago. #2. Second place goes to an international swingman Charles Abouo (196-89, college: BYU, currently plays in France). Abouo led ADA Blois to a victory against the 12th-ranked ALM Evreux (10-15) 91-83 in the French ProB (second division) on Saturday night. He recorded 13 points and grabbed 7 rebounds in 32 minutes. ADA Blois Basket 41 (13-11) is placed eighth in the ProB. It was his team's third consecutive victory in a row. This year Abouo has relatively solid stats: 11.1ppg, 4.2rpg, 1.8apg, 1.3spg, 2FGP: 55.4%(31-56), 3FGP: 33.3% and FT: 86.5% in 12 games. He has a dual citizenship: Ivorian and American. Abouo is in the roster of the Ivorian senior national team. #3. The Ivorian player who performed third best last week abroad was an international swingman Guy Landry Edi (202-88, college: Gonzaga, currently plays in France). He was not able to help Chalons-Reims in their game against Limoges CSP Elite (14-12) in the French Jeep ELITE ProA. Edi scored 9 points. But Chalons-Reims was defeated 88-84 in Limoges by the lower-ranked CSP Elite (#8). This season Edi averages: 3.5ppg, 1.5rpg and FT: 75.0%. He is another player who holds two passports: Ivorian and French. Edi is also a member of the Ivorian senior national team. #4. Center Aboubacar Aboubacar Hima (207-94, currently plays in Spain) managed to help Carramimbre CBC Valladolid in a victory against the 15th-ranked Barca II (9-21) 69-65 in the Spanish LEB Gold (second division) last Sunday. He scored only 4 points and grabbed 11 rebounds in 16 minutes. Carramimbre CBC Valladolid (17-13) is placed seventh in the LEB Gold. It was his team's third consecutive victory in a row. There are only four games left until the end of the Regular Season. So now every game will be critical. This year Aboubacar Hima's overall stats are: 4.7ppg and 5.2rpg in 30 games. He used to play for the Ivorian national team back in 2017. #5. International point guard Jean-Francois Kebe (185-94, currently plays in France) was not able to secure a victory for Saint-Quentin (8-4) in their game against JSA Bordeaux (5-6) in the French NM1 (third division). Kebe recorded only 4 points and grabbed 6 rebounds. Saint-Quentin (#4) was defeated 73-62 at home by the lower-ranked JSA Bordeaux (#6) in the Places 1-10 group. Kebe's total stats this season are: 6.7ppg, 2.1rpg and 2.7apg. He plays currently for the Ivorian national team. #6. An experienced center Mohamed Kone (211-81, college: Valpo, currently plays in France) contributed to a JA Vichy's victory against the 13th-ranked Paris (9-15) 94-80 in the French ProB (second division) in Friday night's game. Kone recorded 16 points and grabbed 6 rebounds in 32 minutes. Jean D'Arc Vichy Clermont Metropole (18-7) is placed fourth in the ProB. It was his team's fourth consecutive victory in a row. This year Kone's total stats are: 8.6ppg, 8.4rpg, 1.2apg and 1.1spg in 25 games. He is an international player who is currently on the senior Ivorian National Team roster. #7. Former international forward Moussa Kone (203-93, college: Hofstra, currently plays in Spain) couldn't help Palencia Baloncesto (17-13) in their game against Caceres Basket (5-19) in the Spanish LEB Gold (second division). Kone scored 6 points and grabbed 8 rebounds. Palencia Baloncesto was defeated 76-70 on the opponent's court by the much lower-ranked Caceres_Basket (#19). There are only four games left until the end of the Regular Season. So now every game is very crucial. Kone has averaged so far 6.0ppg and 5.1rpg. He has both American and Ivorian nationalities. Kone used to play for the Ivorian national team four years ago. #8. Center Adjehi Baru (206-91, agency: Duran International, college: Charleston, currently plays in Spain) couldn't help Leyma Basquet (5-20) in their game against Oviedo CB (20-10) in the Spanish LEB Gold (second division). He scored only 4 points and grabbed 6 rebounds in 16 minutes. Leyma Basquet lost 70-80 on the opponent's court to the much higher-ranked (#3) Oviedo_CB. It was Leyma Basquet's fifth consecutive loss in a row. There are only four games left until the end of the Regular Season. So now every game will be important. Baru has averaged so far 2.5ppg and 2.5rpg in six games. He plays currently for the Ivorian national team. #9. International center Bali Coulibaly (199-95, currently plays in France) couldn't help La Rochelle (4-8) in their game against Charleville-Mezieres (9-3) in the French NM1 (third division). Coulibaly recorded 9 points. But La Rochelle (#7) was edged 84-81 on the opponent's court by the leading Charleville-Mezieres in the Places 11-20 group. There are only four games left until the end of the Second Stage. So now every game will be extremely important. Coulibaly has reliable stats this season: 10.5ppg and 4.0rpg. He is also in the roster of the Ivorian national team. #10. Forward Tiegbe Bamba (204-91, college: Portland St., currently plays in France) couldn't help C'Chartres (12-8) in their game against Caen (7-18) in the French ProB (second division). Bamba recorded 5 points and grabbed 4 rebounds in 23 minutes. C'Chartres was edged 84-83 on the opponent's court by the one of league's weakest teams (#17) Caen. Bamba's stats this year are: 11.0ppg, 4.6rpg and 2.0apg in seven games. He is an international player who is currently on the senior Ivorian National Team roster. #11. International point guard Bryan Pamba-Juille (184-92, currently plays in France) faced previously mentioned Tiegbe Bamba in the French ProB last game. Pamba-Juille helped Caen edge the league outsider C'Chartres 84-83. He recorded only 2 points. Pamba-Juille has averaged so far 7.9ppg, 2.1rpg and 2.4apg. He plays currently for the Ivorian national team. #1. 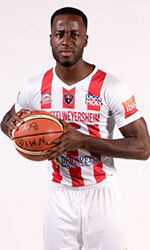 Experienced Alain Koffi (207-C-83, agency: BeoBasket, currently plays in France). He could not help one of league's weakest teams Gravelines-Dunkerque (16-9) to beat Pau-Lacq-Orthez (16-9). Koffi recorded 6 points. Gravelines-Dunkerque was defeated 82-73 on the road by the higher-ranked Pau-Lacq-Orthez (#4). This season Koffi averages: 9.6ppg and 5.5rpg. He has a dual citizenship: Ivorian and French. Traditionally, every week we bring you a list of the top performances of Ivorians who are currently playing abroad. #1. This week's number one is an international point guard Souleyman Diabate (181-87, currently plays in France). He was the major contributor in a Sluc Nancy's victory against the 16th-ranked Denain Voltaire (7-17) 101-94 in the French ProB (second division) in Friday night's game. Diabate had a double-double by scoring 21 points and making 13 passes in 33 minutes on the court. Sluc Nancy Basket Pro (17-7) is placed third in the ProB. It's Diabate's first season with the team. This year he averages: 9.3ppg, 1.3rpg, 5.3apg, 1.2spg, 2FGP: 45.5%, 3FGP: 26.7% and FT: 84.2% in 12 games he played so far. Diabate is currently a member of the Ivorian senior national team. #2. Second place goes to an international swingman Charles Abouo (196-89, college: BYU, currently plays in France). He led ADA Blois to an easy victory against the closely-ranked Gries/Oberhoffen (13-11) crushing them 101-81 in the French ProB (second division) last Friday. Abouo scored 20 points and had 6 steals. ADA Blois Basket 41 (12-11) is placed eighth in the ProB. Abouo has relatively good stats this season: 10.9ppg, 3.9rpg, 1.7apg, 1.2spg, 2FGP: 56.0%(28-50), 3FGP: 34.3% and FT: 84.8%. He has a dual citizenship: Ivorian and American. Abouo is in the roster of the Ivorian senior national team. #3. The Ivorian player who performed third best last week abroad was an international point guard Jean-Francois Kebe (185-94, currently plays in France). He could not help Saint-Quentin (8-3) in their last game. Despite Kebe's very good performance the third-placed Saint-Quentin (8-3) was edged 75-73 on the road by the lower-ranked (#5) STB Le Havre in the Places 1-10 group. He was the top scorer with 15 points in a mere 17 minutes. This year Kebe's overall stats are: 6.8ppg, 1.9rpg, 2.7apg, 2FGP: 56.1%(37-66), 3FGP: 23.3% and FT: 71.3% in 28 games. He is also a member of the Ivorian senior national team. #4. Center Cedric Bah (198-94, currently plays in France) contributed to an easy victory against the fourth-ranked Vendee Challans (7-4) crushing them 73-45 in the French NM1 (third division) in Sunday night's game. Bah scored 10 points, had 7 rebounds and made 3 blocks. BC Souffelweyersheim (9-1) is placed first in Places 1-10 group. Bah's total stats this season are: 9.8ppg, 5.8rpg, 1.5apg, 1.5bpg and 1.1spg. He used to play for the Ivorian national team back in 2017. #5. Former international center Aboubacar Aboubacar Hima (207-94, currently plays in Spain) contributed to an easy victory against the closely-ranked Real Canoe (13-11) 96-79 in the Spanish LEB Gold (second division) last Friday. Aboubacar Hima scored 10 points, grabbed 4 rebounds and made 2 blocks in 20 minutes. Carramimbre CBC Valladolid (16-13) is placed ninth in the LEB Gold. This year Aboubacar Hima's total stats are: 4.7ppg and 5.0rpg in 29 games. He used to play for the Ivorian national team two years ago. #6. Swingman Vafessa Fofana (198-92, currently plays in France) was not able to help Nantes (11-12) in their last game on Saturday. Despite Fofana's good performance Nantes was crushed 99-76 in Orleans by the second-ranked Entente 45. He scored 12 points, had 6 rebounds and dished 6 assists. This season Fofana has relatively solid stats: 10.1ppg, 5.3rpg, 3.0apg and 1.1spg. He is an international player who is currently on the senior Ivorian National Team roster. #7. Former international forward Moussa Kone (203-93, college: Hofstra, currently plays in Spain) was not able to secure a victory for Palencia Baloncesto (17-12) in their game against RETAbet BB (20-9) in the Spanish LEB Gold (second division). Kone scored 9 points in 15 minutes. But Palencia Baloncesto was crushed 88-59 in Bilbao by the second-ranked RETAbet BB. Kone has averaged so far 6.0ppg and 5.0rpg in 29 games. He is another player who holds two passports: Ivorian and American. Kone used to play for the Ivorian national team four years ago. #8. Forward Tiegbe Bamba (204-91, college: Portland St., currently plays in France) couldn't help one of league's weakest teams C'Chartres (11-8) in their last game on Saturday. Despite his good performance C'Chartres was defeated 82-74 in Vichy by the higher-ranked JA Vichy (#4). Bamba was the second best scorer with 13 points. He also added 5 rebounds. Bamba has reliable stats this season: 12.0ppg, 4.7rpg and 2.2apg. He plays currently for the Ivorian national team. #9. International center Bali Coulibaly (199-95, currently plays in France) led La Rochelle to a victory against the tenth-ranked Besancon (2-9) 84-76 in the French NM1 (third division) on Friday night. Coulibaly scored 14 points in a mere 16 minutes. Stade Rochelais Basket (4-7) is placed seventh in Places 11-20 group. Coulibaly's stats this year are: 10.6ppg and 4.1rpg in 25 games. He is also in the roster of the Ivorian national team. #10. Swingman Guy Landry Edi (202-88, college: Gonzaga, currently plays in France) couldn't help Chalons-Reims (17-7) in their game against Monaco (15-9) in the French Jeep ELITE ProA. Edi cannot count Monday's game as one of the best ones. He scored only 3 points. Chalons-Reims was defeated 93-86 at home by the lower-ranked Monaco (#4). This season Edi averages just 2.3ppg. He is an international player who is currently on the senior Ivorian National Team roster. #11. An experienced international center Mohamed Kone (211-81, college: Valpo, currently plays in France) faced previously mentioned Tiegbe Bamba in the French ProB last game. Kone contributed to a JA Vichy's victory against the closely-ranked C'Chartres 82-74. He scored 8 points and grabbed 5 rebounds in 24 minutes. Kone has averaged so far 8.3ppg, 8.5rpg, 1.1apg and 1.1spg in 24 games. He plays currently for the Ivorian national team. #12. International point guard Bryan Pamba-Juille (184-92, currently plays in France) couldn't help Caen in their game against Aix-Maurienne in the French ProB (second division). Pamba-Juille scored 8 points, had 4 rebounds and dished 7 assists. His team was crushed by 23 points 106-83. Pamba-Juille has averaged so far 8.8ppg, 2.0rpg, 2.8apg and 1.2spg. Despite he played previously for the French U20 national team, Pamba-Juille is currently in the Ivorian national team roster. #1. Experienced Herve Toure (205-PF-82, currently plays in France). He could not help GET Vosges (5-3) to beat Lorient (5-1). Toure scored 9 points and grabbed 7 rebounds in 24 minutes. It was his first game for GET Vosges this season. But GET Vosges (#2) was crushed 93-65 at home by the leading Lorient in the Places 21-28 group. There are only two games left until the end of the Second Stage. So now every game will be critical. Toure has a dual citizenship: Ivorian and French.